I know fontenc is not the right way to deal with fonts in luatex or xelatex, but I'm specifically looking for cases where it's detrimental to load the fontenc package. Do you know of any? fontenc is loaded by fontspec (you can check this in the log). So in itself the package is not a problem. But fontenc is a special package: You can load it more than once with different options without getting option clash errors. It will then load font encoding definitions for all the options. E.g. will load t1enc.def, lgrenc.def and t2enc.def. This also is not problematic with lualatex and xelatex. It can cause problems if you load both fontspec and fontenc together. More precisely, as David Carlisle points out, if you combine Unicode with other encodings in the same document—which could happen without your being aware that you loaded both, or even on a document that worked before. Here is an example that loads the legacy Utopia font, which is T1-encoded, but then also tries to load a modern Unicode font through Babel. Permuting the order in which you load packages can give you many different bugs. One of several problems in this example is that fontspec renders all non-ASCII characters inactive, which prevents them from being correctly translated into other encodings. If you re-ordered commands so that you loaded \setbabelfont after fourier, you would instead set the main font to Latin Modern Roman. The rest of my post is about how to get that broken example to work, so if you only cared about the example of something fontenc breaks, you can stop reading. I’m not judging. Sometimes I don’t get to set the requirements. This is much less of a hack and supports several features and scripts that the legacy package does not. You should use Unicode when you can, and legacy encodings when you have to. so it is simplest to tell people not to use fontenc. In addition to the incorrect characters shown in the other answers, even when you get the correct characters, with the xetex and xelatex formats as distributed, hyphenation will be incorrect as only the TU hyphenation patterns are loaded. You can not load hyphenation patterns into a normal document, only when making the format. So setting things up to get correct hyphenation with T1 (or T2 or LGR...) encoded fonts is tricky, not well supported by language packages and will produce documents that will silently produce the wrong results if processed at another site which does not have the custom formats set up. 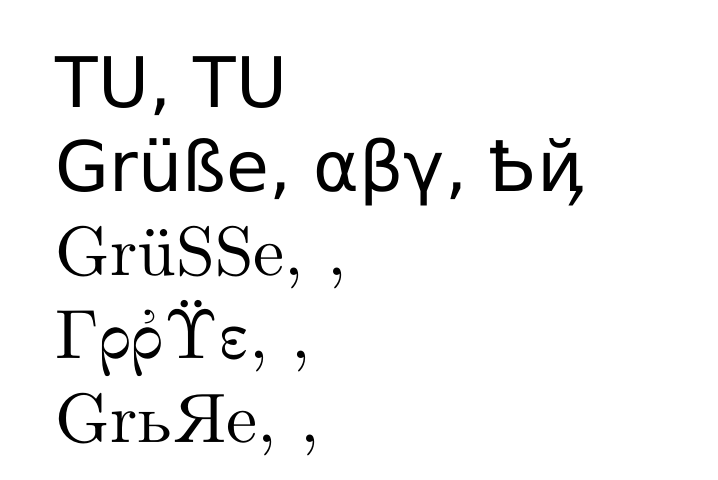 The situation is different with luatex which can load new hyphenation patterns as a result of declarations in the document, but it is still tricky to get right and in almost all cases it is simpler to use a Unicode encoded font. Not the answer you're looking for? Browse other questions tagged fonts xetex luatex or ask your own question. What may cause bookmark accented letters not working on a specific computer?